Saul 'Canelo' Alvarez will not rule out completing a trilogy with middleweight rival Gennady Golovkin in 2019 – a fight his promoter Oscar de la Hoya believes the world wants to see. Alvarez steps up to super-middleweight to take on WBA 'regular' champion Rocky Fielding on Saturday in his first bout since claiming a gripping majority-decision triumph over the previously unbeaten Golovkin. That saw the 28-year-old Mexican collect the WBA and WBC titles at 160lbs after their initial bout in September 2017 ended in a hotly disputed draw. A heavy favourite to become a three-weight champion against Fielding at Madison Square Garden, Alvarez told Omnisport that he feels his long-term future lies at middleweight – bringing Canelo-GGG III tantalisingly into view. "It's not a secret that we want to win this fight on Saturday and then come back down to our division, which is 160lbs," he said. "But we can make combinations, between 160 and 168lbs. We'll see what the future has prepared. "What I can assure you right now is that we will definitely go back to 160lbs." On the prospect of agreeing a second rematch with Golovkin, who believes he should have been awarded the verdict in each of their meetings, Alvarez added: "We'll see. We had two good fights and maybe in 2019 we can have a third fight. "Right now I'm 100 per cent focused on Saturday but I do know that I fight in May and September next year. "So, we'll see and I'll do what I always do, which is to give great fights to the public." Golovkin is currently a free agent in terms of his broadcast deal and, depending upon where the cards fall, De La Hoya wants to make the match again - although he was keen to point out the array of options his man has. "The world wants to see another fight with Triple G, I want to see it, we want to make it happen," he told Omnisport. "There's a lot of great challenges for Canelo at 160, including the likes of the Charlo brothers [Jermall and Jermell], Danny Jacobs, Billy Joe Saunders. 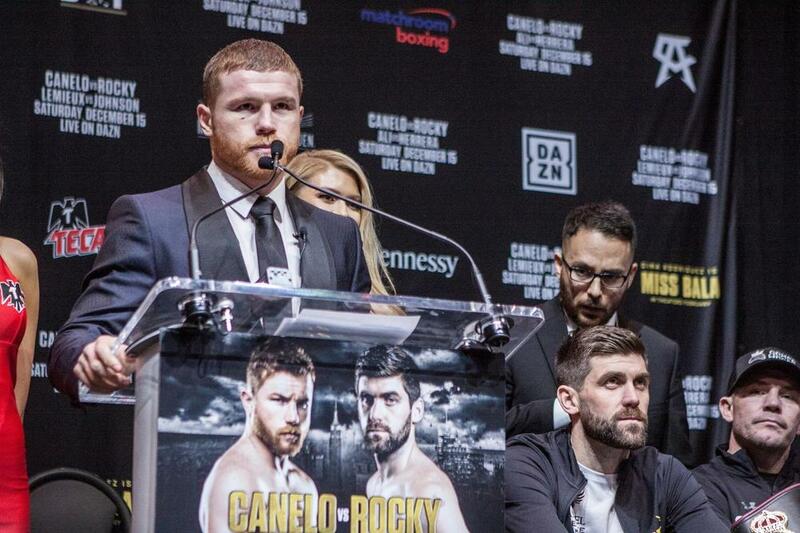 "I think Canelo has the opportunity to make some really good history for himself in this sport for many years to come." How that history is written will define where Alvarez places himself within the lineage of great Mexican fighters such as Julio Cesar Chavez, Marco Antonio Barrera and Juan Manuel Marquez. "I think that, at the tender age of 28 years old, he'll be top three already," De La Hoya said, considering the prospect of beating Fielding, who won his belt with an upset win over Tyron Zeuge last time out. "And he still has a long way to go. I think the fact that Canelo has a lot of great fights ahead of him, the fact that he's still young [means he] has the opportunity to be one of the elite, if not the elite fighter in the history of Mexican boxing." Alvarez himself knows such a lofty status only remains open to him if he does the business at Madison Square Garden. "It's very important to enter into that list of very good fighters from Mexico, to be one of very few fighters who become three-division world champions from Mexico," he added. "To enter history, that's what I want – to make history. "When you make history, doors open. So I'm happy and I'm motivated to win this fight."